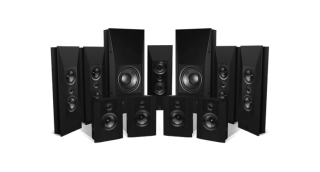 Elipson introduces Infinite home cinema speakers | What Hi-Fi? Elipson has launched three new speakers in its Infinite range, with a dedicated amplifier to follow. Made in Elipson’s factory in France, the Infinite Series comprises the Infinite LCRS14 speaker ­for front, side and surround channels (£1549 a piece); a smaller Infinite SR8 surround channel speaker that can also be used in-ceiling in a Dolby Atmos set-up (£899 per piece); and the Infinite Sub12 passive subwoofer (£1549). Elipson also plans to launch the Infinite A1000 Monaural Class-D amplifier. The release date is yet to be confirmed, but it’s set to cost £1349. Across the range, the mid/bass drivers feature a Rohacell and carbon fibre sandwich 17cm cone, and a rubber surround aimed at improving transient response, while the 29mm tweeters are dome designs. The subwoofers’ 30cm bass driver has a rigid aluminum structure, designed to help the delivery of deep bass, as well as a 76mm voice coil with a central ring for reducing distortion at high volumes. The speakers, which are finished in a satin black frontage and a black brushed aluminum panel, can be installed on-wall or on-ceiling or in-wall and in-ceiling, using the supplied brackets and inlays. They are available now.